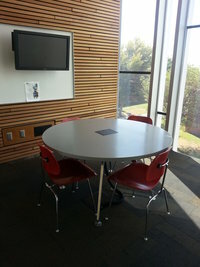 SMCL has 10 study rooms that may be reserved by SMCC affiliates or the general public. These rooms are FREE to use for 2 hours per day, 3 times per week. Rooms must be reserved online, over the phone, or in person with a student ID or Phoenix Public Library card. 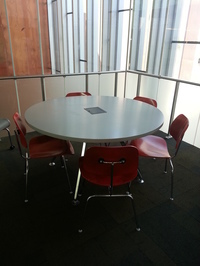 All of the rooms have audiovisual connections to a large LED monitor for easy viewing or group work. VGA or HDMI cables may be checked out from an information desk to connect your device to the study room monitor. 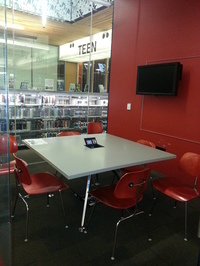 Apple devices require adapters in order to connect to the monitors; these are not provided by the library. Please double-check with a library staff member to make sure the AV connections are working in specific rooms. Some rooms on the 2nd floor include large whiteboards. You may check out markers and erasers from an information desk. Room capacities vary from 5 to 9 people per room. To make a reservation online, visit http://smcc.libcal.com/booking/StudyRooms. To make a reservation over the phone, please call 602-243-8194.